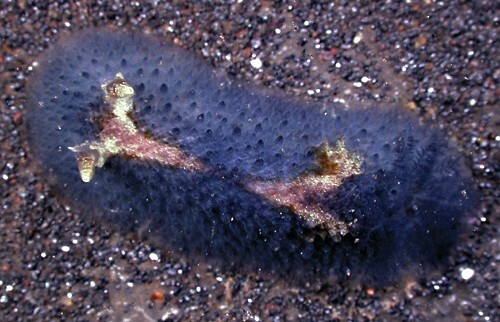 Identification: This dorid usually has a blue body with a "double Y" shaped dusky-white mark on its notum. The rhinophores are flecked with white and the gills sometimes have a yellow rachis. Rarely, it may be dusky-yellow with a blue "double Y" mark. (Note 1) The gills are arranged in a circle. Natural history: Doris nucleola is a moderately common species found under rocks in the low intertidal at protected to moderately protected rocky sites. Rarely, it may be found subtidally to depths of 5 m (16 ft). It's usually found associated with a blue sponge (on which it probably feeds). It lays a cream, spiral egg mass that hatches in five to six days in the laboratory. Distribution: Big Island, Maui, Oahu and Kauai: also known from Japan. Taxonomic notes: This is the species listed as Doriorbis nucleola (Pease, 1860) in Kay, 1979. It is also illustrated in Bertsch and Johnson, 1981 as the right hand animal in the photo labeled Doriopsis pecten on p. 35. It was first reported from Hawaii in Pease, 1860 (as Doris nucleola). Doris papillosa Pease, 1860 is probably a synonym referring to the gray-blue form and animals illustrated on the Sea Slug Forum as Siraius immonda (Risbec, 1928) may also be this species. There's some possibility that the gray-blue and yellow forms could be different species. Photo: CP: 13 mm: Hekili Point, Maui; Oct. 26, 2000. Note 1: We've only seen one animal with the "reversed" color pattern (not photographed) but that appears to be the most common color form in Japan. It was also apparently the form originally described as Doris nucleola in Pease, 1860.